Advances in networking and content delivery systems along with the diffusion of wireless networks, such as IEEE 802.11a/b/g (Wi-Fi), Bluetooth (BT), and cellular 3G networks, are enabling new challenging service provisioning scenarios where users want to access multimedia services with Quality of Service (QoS) requirements, anywhere at anytime while moving among different wireless Access Points (APs). One of the most challenging issues in this highly dynamic environment is service continuity during handoffs, i.e., the capacity to maintain service provisioning and avoid flow interruptions when clients roam through different wireless APs by minimizing or eliminating handoff delays and packet losses. Our original Mobile agent based Ubiquitous multimedia Middleware (MUM) exemplifies how to exploit context awareness based on handoff/QoS/location visibility at middleware level to effectively handle handoffs and to relieve service level from handoff management burden by transparently taking over service continuity responsibility (see figure). MUM uses context awareness to adapt and tune service continuity management and to enable three key middleware features. 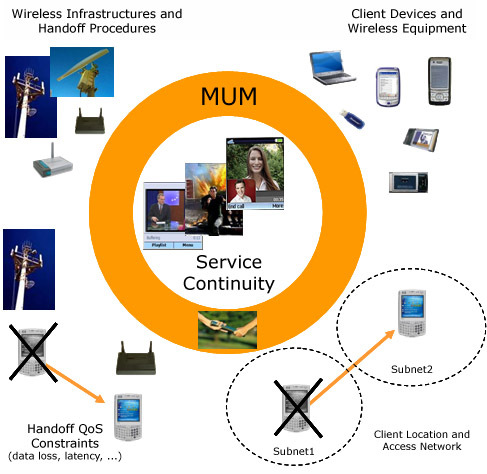 Pro-activity: MUM dynamically monitors the quality of signal at all the wireless network interfaces available at client and predicts possible handoff occurrences to anticipate handoff management. Adaptiveness: MUM chooses among different forms of QoS-aware handoff management and selects multimedia-specific protocols to adaptively minimize network overhead and resource consumption at client nodes. Re-configurability: MUM exploits awareness of client movements and of access network to support dynamic re-bind.